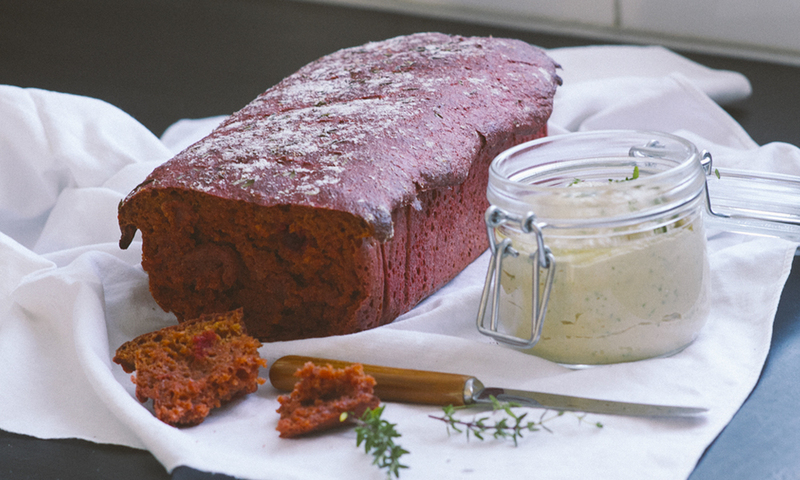 Pink bread: Boil the beets and dice them. Puree in a food processor with 1/2 of oat or soy milk until you get a smooth texture. In a bowl combine yeast, honey and water, let rest for 5 minutes. Now combine flour and salt. Add yeast, beet puree and olive oil. Mix all the ingredients. Work the dough by hand for 10 minutes until it gets soft and elastic. Place it in a greased bowl and cover it with a clean cloth. Let it rise for about 1 - 1 1/2 hours. Remove it from the bowl and place the dough in a form covered it with baking paper. Cover it with a piece of greased plastic wrap. Let it rise about 1 hour. Preheat the oven 200°C. Before baking add a little flour on the top and some thyme leaves. Make some cuts on the top of the bread with a knife. Place the bread in the oven and pour 1 cup of hot water into the boiler pan. Bake for about 40 minutes at 200°C. Let the bread cool before slicing it. 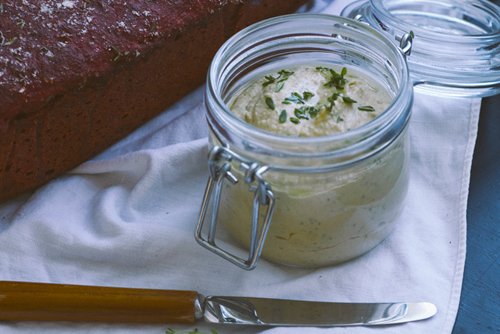 Herb hummus: Place all the ingredients in a food processor, mix until you get a soft texture. If you want it a little bit lighter add some extra olive oil or a little bit of water.